Elvira Alonzo sees recycling as essential to the future. The McAllen public works director oversees the recycling program in the city and ensures its operations go smoothly. Plastic, cardboard, glass and other common materials are moved, pulverized or shifted for reuse in a compound on North Bentsen Road. The operation presents a profitable and a facilitation of services toward the public good. Clean streets, quality drainage systems and maintaining the mission of Keep McAllen Beautiful are among the services of working this sector, Alonzo said. Poor products harm the community, and her work turns the negatives into positives. “That is a part of what we contribute as an organization to the community, providing a better way of life,” she said. Being financially responsible is important to ensure operations have the proper support, Alonzo said. Taxpayer funds offset the expenditures of street and drainage services. Sanitation operations like garbage collecting, recycling and composting charge a fee and are run like a business, according to Alonzo. A city of McAllen employee for more than 36 years, Alonzo’s career in public works began in 1999 as a recycling coordinator. She then worked her way up to her current position, which she has held since 2016. Her start in public works was also something of a milestone, as Alonzo is the first female to manage McAllen’s operation, and one of few women in the state serving in such a capacity. She recalls that earning the respect of the staff provided an initial challenge, but she did not take those uncertainties personally and instead helped forge a team environment. As Alonzo drove around the department on Friday, she acknowledged and encouraged workers as they continued their daily routine. She sees herself as someone who has to set the example for others to follow. “I am willing to roll up my sleeves, and work alongside all of our employees,” Alonzo said. Animal carcasses, drugs and dirty household products are some of the items found during the process of recycling, she added. The recycling program has grown using outdated equipment to more efficient and sophisticated infrastructure, she said. 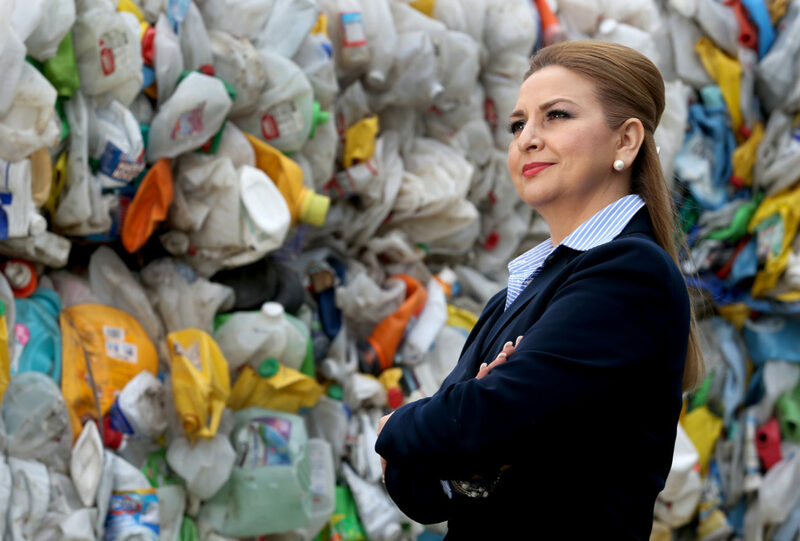 Waste can be prominent in a city, and educating the public on how renewing resources can lessen the damage to nature is an important priority, she said. The city has invested resources to connect the public to recycling and provide a convenient means of doing so. She has worn many hats during her time in working for the city of McAllen, from starting in human resources and later community development after finishing high school. Now in a leadership position, Alonzo said that helping her team grow and seeing the positive impact on residents’ lives keeps her motivated. “I feel that I have a servant’s heart, I get to see the progress, the fruits of their labor,” Alonzo said. Editor’s Note: In observance of Women’s History Month, The Monitor is recognizing local women who inspire us. This is the fifth of eight profiles on those who made our 2019 list of “Women We Love,” a series we’ll publish every Monday and Thursday in March.